A GROWING SHORTAGE OF AFFORDABLE HOUSING AND A SIMULTANEOUS INCREASE IN POVERTY ARE LARGELY RESPONSIBLE FOR THE STEADY RISE IN HOMELESSNESS OVER THE PAST 30 YEARS. 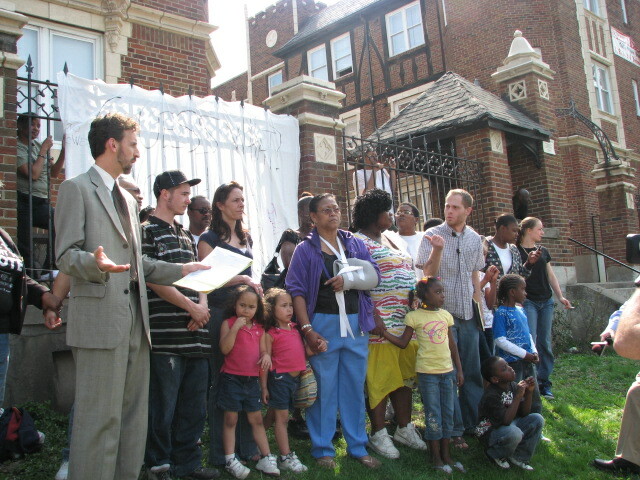 In April 2010, Homeless Coalition staff advocated with and on behalf of 150 tenants in Avondale who were without electric and gas because their landlord squandered their money. Many of them were living outside when the coalition became involved. Affordable Housing and shelters: Since 2011 there has been a lot of talk about moving existing shelters. We have been very clear that we, as a Coalition support the movement of the City Gospel Mission as such a move will double their capacity to serve people. We have also been supportive of the movement of the Mt. Airy Shelter, because formerly it was in a forest and there is not much housing and jobs available in a forest, though it is now no longer a shelter. We have worked against proposals to spend dollars that could be spent on affordable housing for the political movement of shelters. We believe without proper dollars for housing, shelters will be overrun with demand- more than they already are. Already in Hamilton County shelters are exiting people on average in 60 days or less, but yet we have the same general number of people in the beds each night. This means shelters are doing what they are supposed to when someone enters their door- assisting them in finding income and housing. The problem lies in our communities- we do not have enough affordable housing and jobs. Access to affordable housing and jobs prevent and end homelessness. Left Out in the Cold: How Can We Eradicate Homelessness? We will talk about the causes of homelessness, dispel some of the myths, and reflect on how to get involved and be a part of the solution. How to Compassionately Respond to Panhandling!